When it comes to high-touch enrollment marketing to Generation Z, there are few products better than BombBomb. See what it can do for you in today’s post! QR codes are growing in popularity. But should higher ed marketers use QR codes in their marketing strategies? I definitely think so. Here’s why. What if you could make your Google AdWords campaigns as powerful as in-person recruitment meetings? Google’s responsive search ads can help you boost the results of your Google AdWords for education marketing. 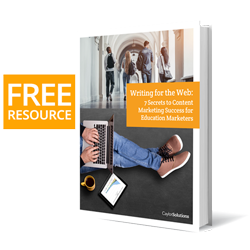 Too often, the name of the game for education marketers is “do more with less.” In the spirit of helping you do just that, I’m going to show you how to create a virtual campus tour of your school with a free tool: Google Maps. It might be tempting to relegate signage to the backseat of your education marketing strategy. But here’s why you should invest in university environmental design from a marketing standpoint. “1.21 Gigawatts? Great Scott!” Be Inspired for your inbound marketing for education strategies from Back to the Future! Last week we talked about the big news around WordPress’s 5.0 and the new Gutenberg editor. So how is this going to affect search engines’ ability to find you? There’s a big change coming to WordPress — Gutenberg. Let’s dive into what you need to know right now about this innovative approach to the CMS we’ve come to depend on and love. Capital campaign microsites are critical to any well-designed capital campaign marketing strategy. Here are five pages you should consider for your microsite. In last week’s post, we learned that your capital campaign has to have its own marketing plan. Here are 17 bright ideas to raise awareness to consider putting into your plan. There’s a lot of excitement when it comes to capital campaigns — and with it comes a ton of pressure for education marketers. Here’s a starters guide for anyone marketing a capital campaign for the first time.